Second half goals from Luke Ayling and Kemar Roofe handed Leeds United a 2-0 victory over Rotherham United in the Championship on Saturday afternoon. The visitors matched up to United opting for the 4-1-4-1 formation and it took time for Bielsa's men to settle into proceedings during the opening period. Luke Ayling celebrates scoring against Rotherham. 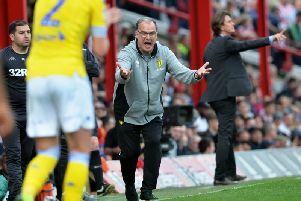 Leeds pressed on as they adjusted and Kemar Roofe had the first real opening of the afternoon after a Luke Ayling cross from the right fell to the striker but his curling shot flew high and wide of the mark. Paul Warne's men continued to grow in confidence and really should have been ahead on the 25 minute mark. Whites skipper Liam Cooper played a harmless ball across his own area to Bailey Peacock-Farrell but the goalkeeper was caught flat footed as Ryan Williams intercepted to strike an effort on goal but the Leeds stopper got down low to block with his legs. Just moments later and the visitors were unlucky once again. Rotherham midfielder Jon Taylor collected a loose ball in the middle of pitch and struck an effort from 30-yards out which cannoned back off the inside of Peacock-Farrell's goal. The Millers had their tails up and Taylor was involved again just minutes later as he saw a headed effort collected with ease before Matthew Palmer struck a shot that was sent whistling just over the bar. Leeds responded through Mateusz Klich as his dipping strike from just outside the area was sent inches wide. Roofe almost opened the scoring once more as Pablo Hernandez floated a ball across the six-yard box but he failed to reach it with his head before a thunderous shot from Gaetano Berardi was met by Marek Rodak on the stroke of half-time with the teams entering the break level. Leeds began the second half very much on the front foot as Ezgjan Alioski sounded a warning to the visitors with a drilled cross that flew past the face of Rodak's goal. Moments later and Leeds were ahead as all of Rotherham's first half work was undone. A Barry Douglas corner was met by a Cooper header before Roofe sliced an effort across the box to Ayling who was all alone. The defender sent a header goalwards but the effort was deemed to be cleared off the line with United protesting furiously against referee Robert Jones' decision. Jones continued to wave away the appeals and pointed for a goal-kick before consulting his watch which indicated the ball had in fact crossed the line after nearly 10 seconds had passed following the incident allowing Ayling to wheel away as Elland Road erupted to celebrate his first goal in Leeds colours. United should've added to their lead as Pablo Hernandez found Samuel Saiz all alone in the area and after picking his spot his effort was blocked off the line by Millers captain Richard Wood this time successfully. The Whites would finally double their advantage as Kalvin Phillips launched a ball over the top which Roofe latched onto and with the striker racing into the area he slotted home a fine finish from a tight angle to hand Bielsa's men a cushion. Rotherham mustered a response through debutant Ryan Manning but his low shot was well saved by Peacock-Farrell in the Leeds goal. United though weren't to be denied as Bielsa became the first manager in the club's history to win his opening four fixtures in charge.